First West Yorkshire is a bus operator in West Yorkshire. It is a subsidiary of FirstGroup. In April 1974 the West Yorkshire Passenger Transport Executive was formed with the municipal fleets of Bradford, Calderdale, Halifax, Huddersfield and Leeds combined under the MetroBus brand with a cream and verona green livery adopted. 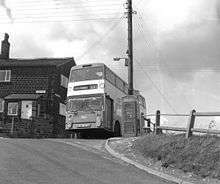 To comply with the Transport Act 1985, in 1986 the West Yorkshire Passenger Transport Executive's bus operations were transferred to a separate legal entity and rebranded as Yorkshire Rider. 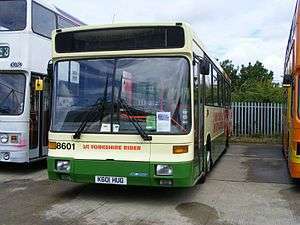 The livery changed to a bright green and cream livery with a stylised "YR" logo, plus the name "Yorkshire Rider", with an area on the logo that incorporated the town in which the garage for that bus was located. In October 1988 Yorkshire Rider was sold in a management buyout. In August 1989 West Yorkshire Road Car Co was purchased from AJS Holdings with services in Bradford, Leeds and Otley. In April 1994 Yorkshire Rider was sold to Badgerline who in June 1995 merged with GRT Group to form FirstBus. In February 1998 all were renamed as First Bradford, First Calderdale, First Huddersfield and First Leeds as part of the rollout of the FirstGroup brand. During the early 2000s, several were merged. 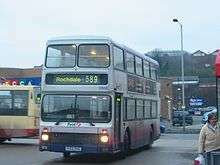 First Quickstep were based at the same Kirkstall Road depot as First Leeds but as a separate entity running several services around the Leeds area until it was merged into First Leeds' operation, while First Calderdale and First Huddersfield merged in 2003 to form First Calderdale & Huddersfield. 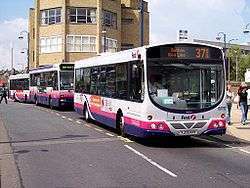 In July 2005, First Leeds took over Morley based Black Prince Buses. On 18 May 2008 First Leeds' Kirkstall Road depot was closed after 111 years of public use and operations moved to a new complex in Hunslet. During 2009, the management of the three First companies in West Yorkshire plus First York were centralised. First West Yorkshire operate the majority of the services in the Bradford, Calderdale, Huddersfield and Leeds areas, consisting of local services serving different areas of towns and cities of Bradford, Halifax, Huddersfield, Leeds and Todmorden, and town-to-town services. The companies also runs services in North Yorkshire (X84), Lancashire (517, 589 and 592) and Greater Manchester (589 and 590). 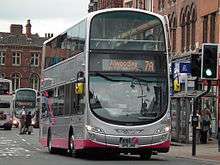 The 184, which operates from Huddersfield to Manchester, was previously a joint operation with First West Yorkshire and First Greater Manchester, however the service is now wholly operated by the latter. In the last few years, First has introduced Overground services on services with a frequent daytime service. The Overground is now a prominent fixture on all First bus companies in the UK and is based on the London Underground network with each service having its own colour line. The towns and cities of Bradford, Halifax, Huddersfield and Leeds each have their own Overground routes, with some services overlapping to another area's Overground map, such as the 184 (Purple Line in Huddersfield and Greater Manchester), 363/X63 (Brown Line in Bradford and Huddersfield), the 503 (Orange Line in Halifax and Huddersfield) and the 576 (Lime Green Line in Halifax and Bradford). On 3 January 2007, a new concept of public transport was introduced to Leeds, the FTR, on the Olive Line 4 service from Whinmoor to Pudsey. It is the second scheme to be introduced by FirstGroup after the first scheme in York. However the scheme in York faced many troubles including underpowering of the engine and ticket machine problems. However the engine problems have been rectified and "Customer Service Hosts" have been employed who will issue tickets to passengers. Also unlike York where the 4 service was converted to ftr vehicle operation within a day. First decided to drip feed the ftr vehicles onto the service so passengers could get used to it and also minimise all other troubles that occurred in York. The ftr are based on Wright StreetCar body which is on a Volvo B7LA chassis, but the chassis on the StreetCars are different from the conventional B7LA, with no "closet" at the rear of vehicle. The livery is designed by Ray Stenning's Best Impressions design agency. First West Yorkshire ran the FreeCityBus service in the city of Bradford and currently run the LeedsCityBus service in Leeds, providing links between the bus and rail stations, shops and universities. The Bradford FreeCityBus has since been transferred to Ladies Only Travel. 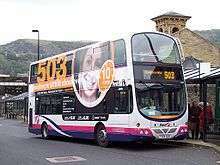 From 29 October 2006, buses running between Huddersfield and Holmfirth were re-branded as part of the HolmfirthCONNECTION. This was a service that was run in partnership with First Calderdale & Huddersfield and First TransPennine Express. It was designed to provide a direct bus to train link for passengers travelling from the Holme Valley on the bus to Huddersfield railway station to connect with trains to Leeds, Dewsbury and Manchester on First TransPennine Express services. Buses 309-316 had their timetables changed and their terminus in Huddersfield moved from the bus station (buses still serve the bus station on journeys towards Holmfirth) to the railway station. The timetable changed to co-ordinate with the trains and included the introduction of a couple of late night journeys between Huddersfield and Holmfirth running after midnight. These service are currently the 314 and X10. Passengers are able to buy tickets on the bus as normal when travelling between the Holme Valley and Huddersfield but were also able to buy tickets on the bus for their train journey as well. The tickets can be bought to be used on the day or for a week. The weekly ticket provides unlimited travel for that week on First buses in the Calderdale and Kirklees areas and on the trains from Huddersfield to Leeds, Dewsbury or Manchester. The offer is an attractive one for people living in the Holme Valley as Holmfirth doesn't have a railway station anymore and their connections to the trains at Huddersfield railway station is made easier as passengers are able to walk off the bus, into the station and onto the train without having to queue up for another ticket. This offer is that train travel is restricted to First TransPennine Express services and is not valid on any Northern Rail train running along the same routes. The other is that the offer is only available for passengers travelling from the Holme Valley and is not available for people starting their journey on First TransPennine Express services from Dewsbury, Leeds or Manchester. In December 2007, First made several changes to its HolmfirthCONNECTION services, withdrawing the 309, 310 and 311 services, extending the daytime 312 service and the 314 service to Holme, extending the 316 service to Parkhead and re-routing the 313 service via Thongsbridge to Holmfirth before continuing to Hepworth. Three express services were introduced, the X10 from Holme to Huddersfield, plus 1 journey each on the X13 from Hepworth to Huddersfield and the X16 from Parkhead to Huddersfield. HolmfirthCONNECTION services underwent changes again in July 2008, with the Monday-Saturday daytime service on service 312 and all journeys on service 315 withdrawn and replaced by new service 308. More changes took place in April 2009, with the 308 terminating at Holmfirth instead of Parkhead, the 314 re-routed between Holmfirth and Holme, the 316 serving Parkhead instead of Holme and the X10 and X16 services replaced by a new X11 service, while in July 2009, all 313A journeys were re-numbered 313. From 27 July 2008, buses running between Huddersfield, Netherton, Marten Nest and Meltham are to be re-branded as part of the MelthamCONNECTION. It is based on the HolmfirthCONNECTION services that was introduced in 2006 to services running between the Holme Valley and Huddersfield. It is designed to provide a direct bus to train link for passengers travelling from Meltham, Marten Nest and Netherton on the bus to Huddersfield railway station to connect with trains to Leeds, Dewsbury and Manchester on TransPennine Express services. Buses 321, 323 and 324 will have their timetables changed but unlike the HolmfirthCONNECTION, their terminus in Huddersfield will stay at the bus station and not serve the railway station in Huddersfield. Passengers are able to buy tickets on the bus as normal when travelling to Huddersfield but were also able to buy tickets on the bus for their train journey as well. The tickets can be bought to be used on the day or for a week. The weekly ticket provides unlimited travel for that week on First buses in the Calderdale and Kirklees areas and on the trains from Huddersfield to Leeds, Dewsbury or Manchester. The offer is an attractive one for people living in the Meltham and Netherton areas as they don't have a railway station and their connections to the trains at Huddersfield railway station is made easier as passengers are able to walk off the bus, into the rail station and onto the train without having to queue up for another ticket. As of February 2014, First bus West Yorkshire has a total of 916 buses, which conclude of 505 double deckers, 411 single deckers and 30 bendy buses. First West Yorkshire operate five depots in Bradford, Halifax, Huddersfield, Hunslet and Leeds. Bradford's Manchester Road Quality Bus Initiative is a £12m ground breaking project developed and funded by a public & private sector partnership consisting of Bradford Council, Metro -with the benefit of Department for Transport Local Government and the Regions (DTLR) funding through the local Transport Plan and First who also invested £1m in the scheme's infrastructure. Extending along 2.3 miles of one of the City's main arteries the initiative aims to deliver significant improvements to Public Transport in the South Bradford area and ease congestion on the City's main southern approach. The initiative includes 1.4 miles of guided busway & 1,320 yards of dedicated bus lanes. The work to create the guiedway took over a year to complete The combination of bus-only guideways, dedicated bus lanes, modern bus stops and shelters, and a fleet of modern, low floor buses specially adapted to run in the guideways, will mean passengers can enjoy more reliable services, improved surroundings, better ride quality and quicker journey times. The Manchester Road scheme consists of a combination of Guided Busways and Bus Lanes together with pedestrian and cycling facilities. The inbound section of Bus Lane run from Croft Street to Bowling Old Lane and Mayo Avenue to Odsal Top and the outbound guideway runs from Bowling Old Lane to Mayo Avenue. The points where buses leave these facilities to enter into the general traffic on the approach to junctions are controlled by traffic signals. Measures improving bus stops, shelters, lighting and information about bus services are part of the development. First are committed to providing modern buses on the corridor, which will give them priority to bypass congestion and minimise delays often experienced at junctions. 1 2 "Holmfirth & Meltham Connection". First Group. Retrieved 15 May 2011. ↑ "Guided Bus Ways - Bradford". First Group. Retrieved 31 October 2011. Wikimedia Commons has media related to FirstGroup buses in the United Kingdom.